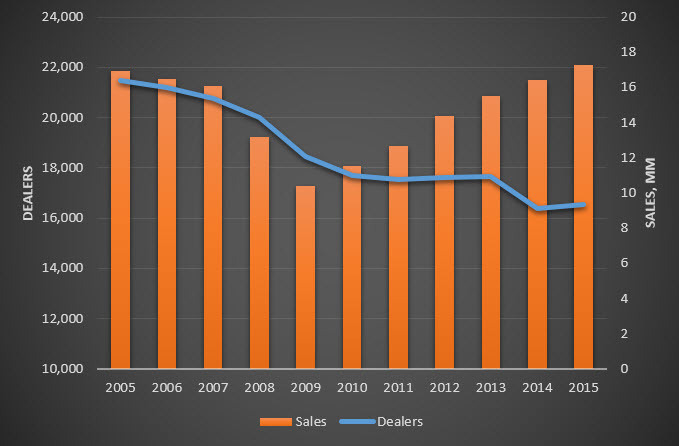 In the 2006 data, NADA noted a “moderate consolidation trend.” Since the recession, sales have recovered but the dealer population has not. My chart, below, is based on the last eleven years of NADA data. You can go back as far as you like. The dealer population has been shrinking steadily for fifty years. This means the surviving dealers are selling more cars per store, but the real story is consolidation – the powerful trend toward fewer owners and bigger groups. In 2005, the top 100 dealership groups were 9% of the total. In 2015, they were 17%. The Automotive News ranking is by gross revenue but, for simplicity, I am counting stores. I imagine that the big, efficient groups command more than 17% of the total gross. Gee group’s purchase of 16 Tonkin stores, backed by private equity, is instructive. Both groups are family owned, with seven and 21 stores respectively. Brad Tonkin will join the combined entity as president. The Automotive News article also describes a Soros-backed purchase by the McLarty group, bringing its count to 19 stores. The owners may be public, like AutoNation and Penske, private equity, or something in between. Larry Miller group, for example, is still family owned but independently managed. An IPO seems the next logical step. Broker Alan Haig predicts his buy-sell business will continue strong in 2017. This is about economies of scale, obviously. The New York Times mentions efficiency in staffing, technology, and inventory management (as I did, here). There is a lot of money chasing this trend, and only so many operators who know how to exploit scale. That’s why Haig also has a recruiting arm. Small dealer groups can compete online only by joining platforms that aggregate inventory. If you are running a small group, you might want to start thinking about M&A. That’s not my area, though. I am interested in the related trends toward technology and process change. I’ll examine these more in my next post. One example is online retail. Small dealer groups can compete online only by joining platforms that aggregate inventory, like TrueCar or Autotrader. What I am proposing is that the (relatively) little guys compete with the consolidators by consolidating themselves online. Dealers should seek help from their OEMs and software vendors. Well, maybe not the OEMs. GM’s Shop Click Drive only searches inventory for a single dealer, and it makes you choose the dealer first. Not only will it not give you a price, it won’t even present a model list until you’ve selected a dealer. No one shops this way anymore. Modern shoppers will have found a model and trim level, a price, and even a lender, before landing on a dealer. While Shop Click Drive has the machinery to structure a deal, and even sell protection products, some genius decided to make the “choose dealer” button its primary focus. Most GM dealers I looked at were also on Autotrader. I did a survey of platform capabilities last year, with Cox Automotive far in the lead. The other guys seem still to be in the world of single-dealer web sites. I also noticed that these sites are mostly hideous, and lacking consistency in even simple functions like credit application. The consolidators have strong tech teams devoted to online shopping. Dealers may fail to see the threat, because it’s not a physical presence. If you owned a hardware store, and Home Depot went up across the street, you would notice.